You must be a member of the Duesseldorf Wines and Spirits Group to attend this activity. Would you like to join this group? We will spend another delightful evening in Carlos‘s cellar, guided through the tasting by winemaker David Ferreira himself, please pencil in the date and venue. This is a prepaid event, details about prepayment will follow soon via PM. In the late Protected content , John Reynolds contacted the La Calmette nursery near Montpellier looking to tap into the ground-breaking viticultural innovations underway in Southern France at that time, for it was “the Midi, not Bordeaux or Burgundy … where the greatest technical progress in wine-making took place in the nineteenth century” (Rosemary George, MW). In the early Protected content , Charles Darwin paid tribute to Henri Bouschet’s lifetime achievements. Pierre Viala’s review of his work was published in Protected content . Generations of hearsay spoke of two professors from Montpellier bearing the same surname – possibly brothers – visiting Mouchão around this time, bringing cuttings of this new inky variety with them. These may have been planted whilst Mouchão was still being leased, long before being purchased (sometime between Protected content Protected content . Despite having focused on cork for half a century, William Reynolds’s role as President of the National Phylloxera Commission in Protected content , showed the Reynolds family still maintained strong ties in Portuguese viticulture around that time. Mouchão may also have been a source of the wines “from Estremoz” – the nearest town to Mouchão – or “superior claret (Estremery)”, as advertised extensively in the New Zealand press from Protected content , by his father Thomas W. Reynolds, a resident in Dunedin since Protected content . 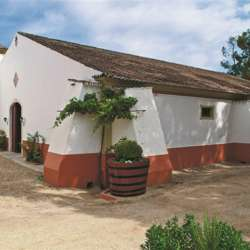 Herdade do Mouchão is a famous and traditional Portuguese winery - still owned by the family Reynolds - which started Protected content top wines. The beautiful barrels of Macacaúda wood (hard wood from Brasil) give the wines complexity, specially the numbers 3 and 4.